Can Hamilton (above) increase his championship lead at Suzuka? Lewis Hamilton's relentless pursuit of a fifth Drivers' Championship continues in Japan on Sunday. James Gray believes the Brit can win again even if he doesn't have it all his own way in qualifying. "Hamilton is [1.64] to secure his fifth win in Japan with Vettel [4.7]. The Brit can leave Vettel in his dust on Sunday." 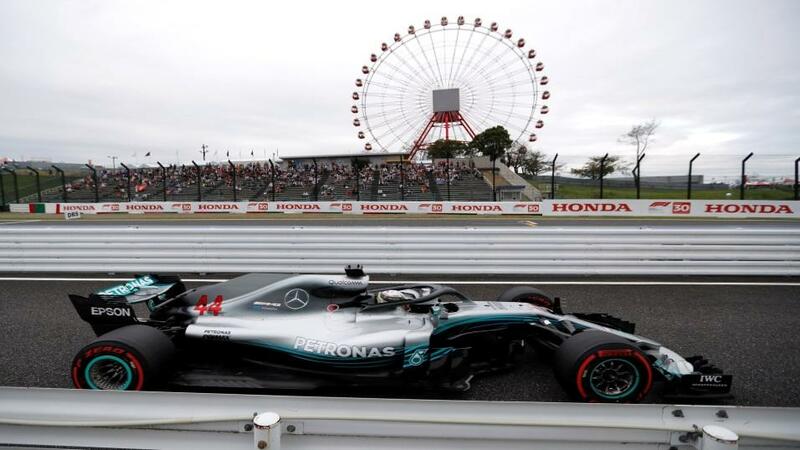 Lewis Hamilton fans in the UK will have to get up pretty early to watch him race in Japan on Sunday - 06:10 to be exact - but they are unlikely to be disappointed by the result. Hamilton is on a roll, winning the last three Grands Prix and eight of the last 13. Even when he hasn't triumphed, he has been on the podium on three of those occasions. In the context of such form, it is a testament to Sebastian Vettel and Ferrari's speed that the German is only 50 points adrift, even if such a gap with five races to go leaves him a massive [27.0] on Betfair, with Hamilton [1.03] to win the Drivers' Championship after last week's victory in Russia. At this point, only two retirements for the Brit can realistically save Vettel's hopes of beating his rival to a fifth world title. A curious and unique circuit, Suzuka was a favourite of Michael Schumacher who won there six times. It has been a happy hunting ground for Mercedes in more recent years. The Brackley-based outfit have won each of the last four races here and look a safe bet to do so again if Friday's practice sessions are anything to go by. Even if Ferrari were running their engines in "conservative" mode, the gap of more than 0.8 seconds between Hamilton and Vettel will concern those in the red garage. What can halt Hamilton's charge? Realistically, Vettel alone will not be able to stop Hamilton from winning the title. At this stage, he needs help. One thing he might rely on is the unpredictable nature of qualifying for the Japanese Grand Prix. The nature of the circuit means that it becomes crowded during qualifying and the struggle for clean air is very real. Vettel is without a pole in the last five races but has a better average qualifying position (2.19) than Hamilton (2.81) - and if your hot or warm-up laps are disturbed at the busy Suzuka, there is often little you can do about it. Given the relatively random nature of the traffic, Vettel is generously priced at [5.1] to snap that streak without topping the grid on a Saturday. Red Bull to the rescue? Vettel might also look down the pit-lane for some help from his fellow competitors to rob Hamilton of some points and there can be little doubting the form of Max Verstappen, who is out at [17.5] for the overall race win. Despite taking an enormous engine penalty in Sochi, the Dutchman wove his way through the field from 19th on the grid to finish fifth, and that came on the back of a second-place finish in Singapore. However, Verstappen's radio messages would have made poor listening for Vettel on Friday. "It's like rallycross, drifting everywhere," Verstappen complained. The Red Bull's struggles leave Vettel's team-mate Kimi Raikkonen very attractively priced at [3.1] to finish on the podium, especially if Valtteri Bottas becomes nothing more than a Mercedes pawn. It means that Hamilton's biggest challenge might be himself. It was in Japan two years ago that he experienced the blip that Nico Rosberg has so often talked about, the one that gave the German the chance to win his first and only F1 World Drivers' Championship. Things could hardly seem more different this time around. "This track is awesome. I'm having the best day!" said Hamilton after topping the time-sheets in both first and second practice sessions. With such pace and comfort, it is hardly a surprise that Hamilton is [1.64] to secure his fifth win in Japan with Vettel [4.7]. The Brit can leave Vettel in his dust on Sunday, even if Saturday is the more dangerous occasion.